I was surprised to see this slide in a presentation for a new startup idea. (The startup idea is the column at the right, MusicWalla). More features isn’t better. More features is unfocused. More features means you’ll do them worse. More features means you probably don’t have any differentiation. If you’re doing a startup, you should have less features than your competitors. If you have more features, you’re probably doing it wrong. Previous postPerson:alive, dead, undead or fictional? More features may also mean you know your market well, have done extensive behavioral studies and have deep insight into the self-categorizing of users through feature sets. I would argue that if you compare features, they should be value focused rather than semantic. So you shouldn’t compete with existing players by providing new features. Check. The issue is not the number of features, the issue is what problem are you solving. Are addressing a problem for a set of people who are not currently being well served? And how easy would it be (not just technically but from a business model perspective) for existing solution providers to address this under-served group? More features does not always mean a worse startup product, that’s insane. Sure, some of the best and most successful startups are very simple (Highrise, Shopify, etc). But there are plenty of startups that REQUIRE those extra features. In your example, MusicWalla is taking on Pandora. 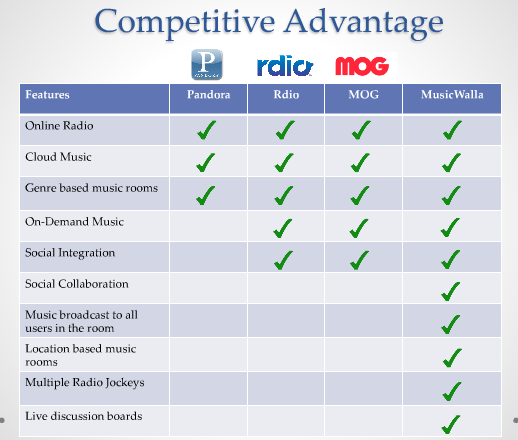 If they just copy Pandora’s idea, and add LESS features than Pandora, who the hell would switch? I believe you mean “fewer features”, not “less features”. Exactly – if you’re not original and inventive then you and your 25+ new features will be buried along with the rest of the herd. I agree whole heartedly. I’ve been saying this for years. The more features you add, the more stuff you’ll have to think about and support with each new feature you add. I think you’re generalizing a bit too much. Whether you have more or less features than your competitors depends on a lot of factors. It should be *fewer* features (not less) and it’s not always that black and white. I am a strong advocate of the “less is more” motto – and I evangelize around me every day at work. But sometimes the world is not black nor white, and having more features is not necessarily bad: it all depend about the purpose. If all your features seamlessly integrate in the flow of normal usage, so be it. This said I eventually agree with you, this slide should NEVER be used to showcase the betterness of one’s startup, nor even exist – instead, founders should focus on demonstrating how better their product is at accomplishing its mission.